Francois (who goes by Blan) and partner Daniel Tillias founded Jaden Tap Tap, a community garden in the heart of the neighborhood. Anyone who works on the farm can help themselves to the produce, which includes sweet potatoes, cabbage, spinach, kale, moringa (a nutrient-dense green) and more, all items that can be expensive and difficult to come by in Haiti. “Haitians’ stomachs depend on food coming from the Dominican Republic, or people have to stand in line just to wait for food from an NGO,” Francois says. He believes that the ability to grow food for oneself means more than staving off hunger and malnutrition (although those benefits are crucial). It also instills a sense of pride and self-sufficiency. Francois’ dream is that Jaden Tap Tap will inspire others to create gardens of their own. 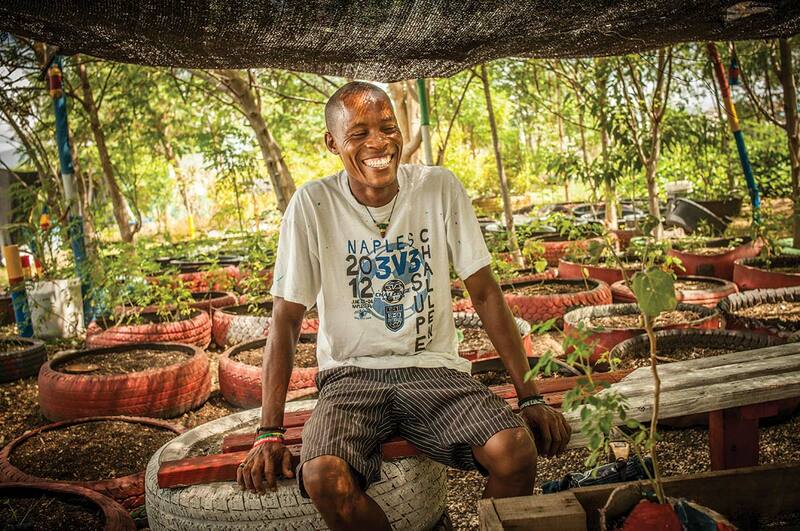 Teaching the community to farm has also yielded benefits beyond supplying much-needed food: Explaining that infected waste should not be composted helped curb the spread of cholera, and showing people how to use old tires as planters helped reduce the number that were burned (a common source of pollution in the neighborhood).